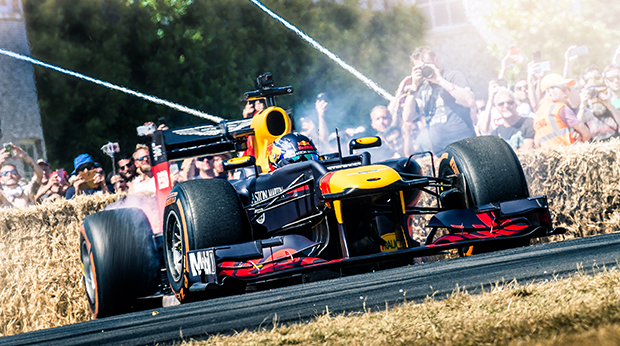 As the Festival of Speed, presented by Mastercard, enters its 27th year, it’s only right that many of the current crop of Formula 1 teams will return to Goodwood on 4-7 July. This year, six teams are already confirmed to attend the Festival of Speed with several of the current drivers. Goodwood’s relationship with current Formula 1 teams started in the Festival of Speed’s second year. In 1994, Williams, Arrows and McLaren brought crews to the event, with the latter bringing the then-current, Peugeot-powered MP4/9. Having smashed the Hill record with a 47-second ascent, McLaren driver Martin Brundle commented: “We actually ran the car very conservatively. If we’d set about it, swapped the hard tyres for something a little softer, I think you’d go up there in 42 seconds.” Little did he know how accurate a prediction that was. The highlight for many during the past 26 years was Nick Heidfeld’s 41.6-second record run in the McLaren-Mercedes MP4/13. Aged just 22, Heidfeld was McLaren’s test driver at the time, and was sent to Goodwood by McLaren Managing Director Martin Whitmarsh under the strict instructions to get the record. It remains standing to this day, largely down to the ban on F1 cars doing timed runs the following year. Johnny Herbert was there in 2000, driving the new Jaguar Formula 1 car up the Hill, and he set the standard for the future by replacing outright speed with donuts and burnouts. That year was also Jenson Button’s first appearance of 16 in a row. His relationship with Goodwood was celebrated last year with an interview by Mark Webber on the House balcony, having driven up the Hill in Honda’s RA301. In his first year of Formula 1, in 2007, Lewis Hamilton was welcomed to the Festival of Speed as a conquering hero. He became a fixture of the event for nearly a decade, also celebrating his first championship year in 2008 with a House balcony appearance. With the F1 season now underway in Australia, the Festival of Speed is the best opportunity to see the cars and drivers up close this year. Tickets for the Festival of Speed are available from www.goodwood.com and from Goodwood Customer Sales on 01243 755 055.